Copyright: © 2016 Elamin Abdelgadir EI, et al. This is an open-access article distributed under the terms of the Creative Commons Attribution License, which permits unrestricted use, distribution, and reproduction in any medium, provided the original author and source are credited. Pityriasis Rubra Pilaris (PRP) is a chronic inflammatory dermatological disease, the cause of it is not yet clear. Researchers have linked it to autoimmune disease, infections like HIV and streptococcal diseases. There was an established link hypothyroidism. This was significant in the view of some researchers to recommend thyroid function test (TFT) as part of PRP assessment. We are presenting a 24-year old lady with a full picture of thyrotoxicosis (Grave’s disease). At the time of she started appreciating the symptoms of the thyrotoxicosis; she started feeling extensive skin dryness, scaling and skin breaks at the joints and the extensor surfaces. She sought dermatological advice in many centres, with no response. With the thyrotoxicosis treatment the skin jeopardy started to improve while she was only on emollients. The skin findings completely vanished after the radioactive iodine (RAI). This was the first report of PRP in association with Grave’s disease. This link needs to be confirmed with more case reports. Vanishing skin changes with the thyroid settlement could make it part of the treatment of the PRP. This might strengthen the recommendation of the previous papers of adopting TFT as part of the PRP workup. Pityriasis Rubra Pilaris (PRP) is a chronic inflammatory dermatological disease, the cause of it is not yet clear. Researchers have linked it to autoimmune disease, infections like HIV and streptococcal diseases. There was an established link hypothyroidism. This was significant in the view of some researchers to recommend thyroid function test (TFT) as part of PRP assessment [1-6]. PRP has different presentations and hypothetical causes, this divides the diseases into 5 classes classic adult type, classic juvenile, circumscribed juvenile, atypical juvenile , and recently HIV-associated has been added . Tissue necrosis factor-alpha (TNF-alpha) has been incriminated to be the driving pathophysiology of the disease . Nonetheless, other factors have been suggested to play a role like vitamin A deficiency, post-infectious, biological agent’s administration like Sorafenib [8,9]. There were variable responses to topical/oral vitamin D derivatives, tazarotene, methotrexate, and TNF-alpha inhibitors . A 24-year-old lady presented with weight loss, tremor, excessive sweating, hair falling out, and nervousness. Almost at the same time of those symptoms she started to notice severe hand and feet dryness and scaling of the skin. There were no other symptoms pointing to other system affection. She was not known to be atopic. She was clinically thyrotoxic, she had a palpable goitre with an audible bruits. But there were no eye signs. Skin was remarkably dry, with some hyperkeratotic changes at the hands and feet and widespread squamous plaques over the extensor surfaces of the joints. Further workup showed T4: 88.2 pmol/l (11.5-22.7), T3: 50.2 pmol/l (3.5-6.5), TSH: <0.01 uIU/l (0.55-4.78), ATG: 14.0 IU/ml (<100), Thyrotropin Receptor Antibodies: 7.89 IU/l (<1.75). Thyroid scintigraphy showed homogenous systemic enlarged gland with high diffuse uptake through both lobes measuring 7.6% (normal 0.4 to 4%), suggestive of Graves’s disease. Abdominal ultrasound showed a normal sized liver with normal echotexure, no evidence of focal lesions. She received Carbimazole followed by RAI later. Before starting the Carbimazole, three different dermatologists who concurred the diagnosis of Pityriasis Rubra Pilaris saw her; they tried emollients, retinoid derivative with no any improvement. Unfortunately no tissue biopsy was obtained, since they were all confident with the clinical diagnosis of PRP. Interestingly, the skin changes improved remarkably after the normalization of the thyroid status, while she was only taking over the counter emollients (Figure 1). 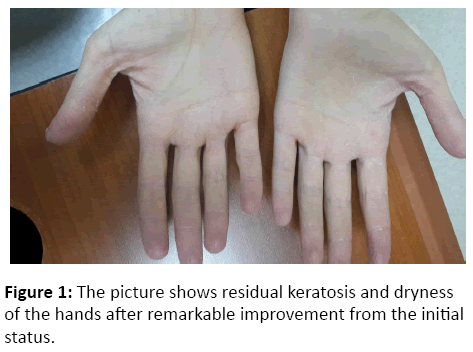 Figure 1: The picture shows residual keratosis and dryness of the hands after remarkable improvement from the initial status. This is a patient with typical PRP and grave’s disease. With an unexplored hypothetical link between the thyrotoxicosis and the PRP, since the skin manifestation did not respond to any topical agent that is usually help in the PRP treatment, but vanished with the normalization of the thyroid function (improved after the oral anti-thyroid medications, and disappeared with the RAI). Since vitamin A is suspected to play a major role in the PRP causality; and since the thyroid hormone is one of the cofactors in the vitamin A metabolism, it was easy to indirectly link the thyroid deficiency with PRP [11-13]. Moreover Aline et al. have concluded that TFT has to be an integral part of the PP assessment . Interestingly, before this care report, hyperthyroidism was not expressed as a risk factor for PRP. Simply the skin manifestations in our case have regressed after the thyrotoxicosis treatment, this could be due to our assumption (thyrotoxicosis link with the PRP), or it can be simply just a weaning phase of the (Wax and Wean) nature of the disease. In our case, this might be further clarified by monitoring the relapse of the PRP and/or the thyrotoxicosis in the future, and whether they come together or otherwise (Figure 2). 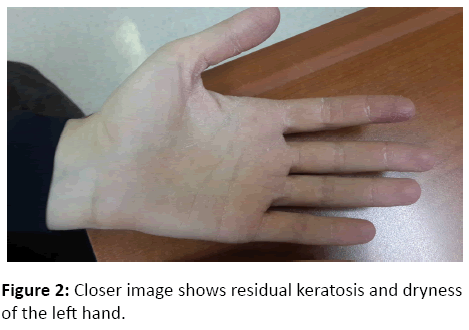 Figure 2: Closer image shows residual keratosis and dryness of the left hand. PRP has been linked to many autoimmune diseasesmyasthenia gravis, coeliac disease, and hypothyroidism [11-14]. Worth thinking of; autoimmunity could be the driving key to understand the link between PRP and the thyrotoxicosis in the future. This was the first report linking PRP with Grave’s disease. This link needs to be consolidated with more case reports, and perhaps with large-scale studies. In order to confirm or discard this assumption; further case reports or may be an observational series assessment are highly needed. We thank the laboratory department at Dubai hospital for accelerating the blood tests. We acknowledge the patient herself for the cooperation. Fuchs-Telem D, Sarig O, van Steensel MA, Isakov O, Israeli S, et al. (2012) Familial Pityriasis Rubra Pilaris Is Caused by Mutations in CARD14. Am J Hum Genet 91:163-170. Mohrenschlager M, Abeck D (2002) Further clinical evidence for involvement of bacterial superantigens in juvenile pityriasis rubra pilaris (PRP): report of two new cases. Pediatr Dermatol 19:569. Martin AG, Weaver CC, Cockerell CJ, Berger TG (1992) Pityriasis rubra pilaris in the setting of HIV infection: clinical behaviour and association with explosive cystic acne. Br J Dermatol 126:617-620. Griffiths WA (1992) Pityriasis rubra pilaris: the problem of its classification. J Am Acad Dermatol 26:140-142. Franzotti AM, Avelar JCD, Cardoso TA, Pires MC, Vidigal MR (2014) Pityriasis Rubra Pilar and hypothyroidism. An Bras Dermatol 89:497-500. Blasdale C, Turner RJ, Leonard N (2004) Spontaneous clinical improvement in HIV-associated follicular syndrome. Clin Exp Dermatol 29:480-482. J Drugs Dermatol 2014 13:610-612. Zhang YH, Zhou Y, Ball N (2010) Type I pityriasis rubra pilaris: upregulation of tumor necrosis factor alpha and response to adalimumab therapy. J Cutan Med Surg 14:185-188. Paz C, Querfeld C, Shea CR (2011) Sorafenib-induced eruption resembling pityriasis rubra pilaris. J Am Acad Dermatol 65:452-453. Eastham AB, Femia AN, Qureshi A (2014) Treatment options for pityriasis rubra pilaris including biologic agents: a retrospective analysis from an academic medical center. JAMA Dermatol150:92-94. Amann et al. 2015 Acta Derm Venereol 95:329-331. Tunnessen WW Jr, Nieburg PI, Voorhess ML (1976) Hypothyroidism and pityriasis rubra pilaris. Response to thyroid hormone. J Pediatr 88:456-458. Orlandini V, Cogrel O, Doutre MS. Pityriasis rubra pilaris and hypothyroidism. Efficacy of thyroid hormone replacement therapy in skin recovery. Br J Dermatol 156:606-667. Gross DA, Landau JW, Newcomer VD (1969) Pityriasis rubra pilaris. Report of a case and analysis of the literature. Arch Dermatol 99: 710-716.